Sir Charles Spencer “Charlie” Chaplin is the world renowed comedian. If you haven’t heard of him, you don’t know a very important part of the history!! Well you all must be thinking why I am mentioning him here? He is a comedian alright, but his signature costume is something which has been imitated over decades. This legendary attire really inspired me a lot. So after a long M.I.A. from outfit creations, I am back with a Laughter (not literally). 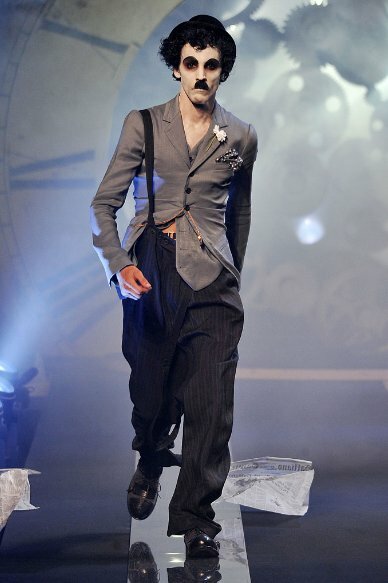 And I present to you Chaplin Couture!! Color Blocked Shirt : Since we live in a colorful world, I thought I should give some color to this outfit. Chanel Perfume No 5 : Now this perfume does not need any introduction. Not because of the fact its “Chanel” but the very fact that it has been one of the famous vintage perfumes till date. Mustache Ring : This ring is an accessory lover’s favorite. It somehow reminds me of Charlie Chaplin’s bushy mustache. Tanned Brogue Wedges : Brogues have seen transformation in recent years and they have just got elevated. These wedges will go perfectly well with my next item. This clip is one of my favorites from the Charlie Chaplin series. Take a look. So does Charlie Chaplin Inspire you as well? Or do you have any other inspirations you want to mention?